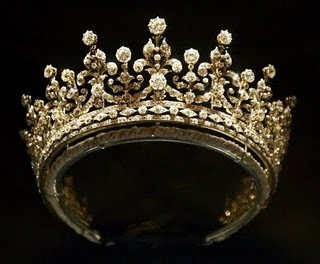 Before I asked you to show me your favorite tiara, I showed you mine...and you agreed with me! Sweet, sweet validation. And I’m pretty sure Queen Elizabeth agrees with all of us, since this is her favorite tiara. This tiara was one of the future Queen Mary’s wedding presents in 1893, and you’ll never guess who gave it to her...the girls of Great Britain and Ireland. Specifically, a committee of them chaired by Lady Eve Greville (not the same lady as the Greville inheritance, mind you). The committee raised over £5,000 and purchased this tiara from Garrard before donating the remainder of the funds to charity at the request of the princess. 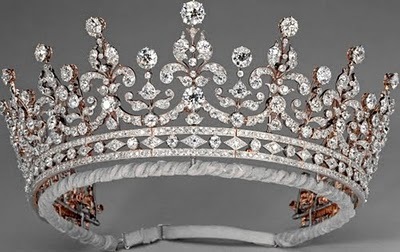 The tiara is a diamond design of festoons and scrolls set on a bandeau base of round and lozenge-shaped diamonds. It was originally topped with nine large pearl finials, and it could also originally be worn as a necklace. But you know Queen Mary, she never left her jewels alone, and so the original version did not stay put for long. In 1914, she removed the pearl finials (they went to the new Cambridge Lover's Knot Tiara) and replaced them with simpler diamond collets (taken from the dismantled Surrey Tiara); she also removed the base of the tiara and used it as a separate bandeau. 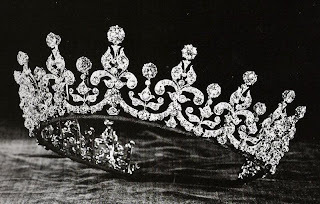 In 1947, Mary gave the tiara to her granddaughter Princess Elizabeth as a wedding present, who is said to affectionately call it as “Granny’s tiara”. Right away, with tiara occasions coming back in vogue after the war, this became a frequently worn piece. Without the bandeau, it nestled right in with Elizabeth's never-changing hairstyle. ﻿Anyway, with her new tiara knowledge in hand, Queen Elizabeth paired up the bandeau and the tiara once again. She made the change in 1969, and it’s been the same ever since. Though she'd already been queen for some time when she added it back in, it seems a fitting queenly makeover. A little extra height for the boost in position, maybe. It's all diamond (at least it is now), so that makes it nice and all purpose. It’s classically pretty - no real experimentation going on here, which tickles my particular fancy at least. And I think the design makes it easy to pair with a variety of styles of other jewelry (necklaces, etc.). It’s big enough to say “I’m the Queen!” without screaming it loudly over every other aspect of one’s outfit. It’s also sizeable but light, which is always good for pretending it’s in your own collection (don’t pretend I’m the only one doing that, I know what your game is). And it’s sparkly. Oh, so sparkly. What more could you ask for? Does this top your personal list? Tomorrow: I will have a recap of the full Top 15. I'm eager to hear your thoughts on the countdown as a whole; until then, do enjoy your #1 gem.